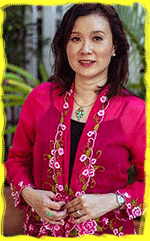 Benita Fong enjoys traveling and spending family time with her husband and 4 children. For over a decade, she has been an educator of humanities subjects like sociology, literature and cross-cultural communication. She loves children and is a certified Audiblox provider. She graduated with a Bachelor of Arts (Major English Literature/ Language, Minor Sociology), from the National University of Singapore, Master of Arts (Communication Studies) Macquarie University, Australia and Master of Arts (Education) Durham University, United Kingdom. She believes that to know where you are going, you need to know where you come from. Thus knowing one’s history and culture is so important. Besides Johnny Can Dream, Benita has also written Johnny Can See: A visit to the eye doctor and Johnny Can Fly: A visit to Singapore.